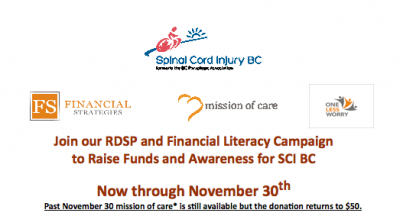 I recently heard about FS Financial Solutions Mission of Care program through Spinal Cord Injury BC (SCI-BC), and although I was a touch skeptical going in, as I naturally am, I’m glad that I did. The FS Financial Solutions Mission of Care program offers a $50 dollar donation to a charity of your choice when you go in and get a quick “crash course” in finances. And for the month of November they increased it to $100! I, of course, chose SCI-BC with it being near and dear to my heart. SCI-BC had set up a direct promo as noted in the above image, but absolutely anyone can go in and talk about any financial situation they feel like. Just showing up, having a coffee, talking for a bit and leaving resulted in a donation to an organization that you care about. I think that’s pretty amazing. And, as in my case, you just might learn that you’ve got thousands of dollars available in grants and bonds that you had no idea about that can be put into a long term Registered Disability Savings Plan (RDSP) savings account so that maybe your retirement years aren’t so scary to think about – talk about a massive weight lifted off my shoulders. And just a little tidbit from what I learned from Kay Wheeler, who I absolutely loved: if you have been approved for the Disability Tax Credit through the CRA, you’re eligible for the RDSP, too. This potentially equals thousands of dollars in retroactive bonds, and potential grants, that you may be able to have plopped straight into an RDSP for you. Having said that, I have been told that the RDSP is not for everyone. But, that’s what this session with FS Financial Solutions was for… to find out if it is for you! I found them to be wonderfully friendly, educational, helpful, and not at all pushy or sales-like. Their attitude was that if a conversation leads to a partnership, then great, but they’ve set this program up to educate first and foremost. What I liked most about my experience is noting how similar FS is to Murphy Battista in its philosophy. That, essentially, sure you may be a business and can make money, but you can make a difference and contribute to the community while you do it. To me, this is a powerful reason why I love my job so much and I’m happy that I’ve found a place I actually feel comfortable discussing financial ideas – never mind that just by talking with a wonderful person I generated money for a cause I am passionate about. In addition to the Mission of Care Program, FS Financial also runs the One Less Worry program which is essentially a “How-To” guide for navigating the numerous programs and initiatives supported by the Canadian Government specifically for the benefit of people with disabilities. Check out the video for an explanation of the program. to set up an appointment, and you can visit their websites at www.fsfinancial.ca.